Yep, sometimes she grants some nice stuff. This one below was what I got some days ago. That Evil Eye in the Ore Mine, it looks like mini-dungeon. Do you think that is possible to get three Mythical Idols? Well, we have proof that we can get Mythical in each different slot, so if each of them has their own odds of appearing, then yes. In a very rare occasion, that is. As well as getting Epic Essences on three. 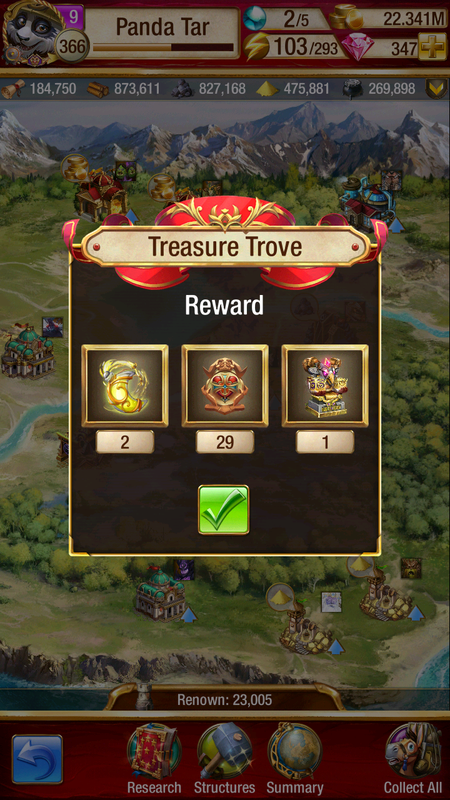 But I don't recall getting 2 rare resources at the same time, ever. Or Totems. So, there might have restrictions on those, perhaps? Yes I think each slot can give anything from possible options, a bit like casino. From these two, one gave me an Epic and the other another Leg for my GW armies. Last edited by Galaad on Oct 26 2018, 21:55, edited 1 time in total. Meanwhile, killing Anubis this time gave me 3 Epic essences only. Well, can't hit the jackpot everytime. I got 3 GEs only a few times from the Kingdom creature. Last edited by Galaad on Oct 29 2018, 17:42, edited 2 times in total. Yep, it has its uses. Coincidentally, blue ones, just like the Lady of the Lake of that same day. But my Walrus was already 4-dot and completely finished, so I'm focusing on my naga and drake now. I have never gotten 3 Legendary Essences. 2 at most. That goddamn abomination pony-dog Kirin from hellish hell is the master of providing only Epic essences, to make me hate it even more. Essences always honor the color of the lady. With exception of Sunday, where the Lady is "Wild Card". Panda Tar wrote: Yep, it has its uses. Coincidentally, blue ones, just like the Lady of the Lake of that same day. But my Walrus was already 4-dot and completely finished, so I'm focusing on my naga and drake now.